The Saint Vincent 2005 is offically over. The decorations are still up, but on my walk this morning I witnessed the porta-potties being picked up, as well as the wealth of empty wine bottles strewn here and there. It’s still too early for the official word on whether it was considered a success or not in terms of attendance, arrests, and the like. However, I do know that Franck and I crashed into bed last night very contented with our Saint Vincent weekend. It started Friday night in frigid -10 temperatures and a brisk glacial wind curtesy of our friends the Russians up North. Earlier that week we had been given boxes of crepe paper flowers made by Franck’s great grandmother and his aunt in Volnay, but come Friday we still hadn’t got around to decorating our house yet, and the girls were giving us serious grief about it. So as soon as we got home from picking the girls up at school Friday evening we set to work bedecking our nut tree out front with blossoms. The girls’ enthusiasm waned after about ten minutes in the freezing cold. At that point they declared that they were going inside and would watch us work from the window. After about fifteen minutes Franck and I still had two full boxes of flowers to go. It was getting dark and I could no longer feel my fingers. We eventually had to turn the headlights of the car on for light, and by the end we were just sticking them on any which way – esthetic considerations be damned! But when we got up Saturday morning our decorations didn’t look nearly as half-hazard as they should have. We bolted breakfast, bundled up, and went in to the centre of the village in time to greet the cortege of Saint Vincent statues coming from Magny-les-Villers. Each village has their own wooden statue of Saint Vincent, and some of them are very, very old. Of course, everyone thinks that their villages’ statue is undeniably the most beautiful. At first we thought we had missed the parade. But then the thin sound of an accordian wafted through the air, and we started walking towards Magny. I had heard rumblings over the past few months that while many villagers were delighted to be hosting the Festival, we were still a long way from unanimity. Not only were there the usual concerns about noise and traffic, but the event also highlighted the feuds between the village winemakers, some of which date back not decades but generations. The upshot of this was that only about half of the ten or so big winemaking families were taking part in the festival and offering tastings. The other ones were firmly entrenched in the anti-festival camp. So when I walked past the house of one of the rebel winemakers in question, I wasn’t suprised to see him standing on his porch with his hands on his hips, giving the oncoming delegation from Magny the hairy eyeball. However, I was surprised to have him whip by us seconds later in his huge, expensive car and head straight for the Magny delegation at about 100 km an hour. I held my breath until at the statue of the Virgin Mary, just metres from the cortege, he braked suddenly and turned right onto a small path between the fields. Perhaps he had been swayed by the wildly gesticulating yellow-vested volunteer, or perhaps it was another miracle to chock up for notre Marie. Or, more likely, he had simply made his point. When we finally met up with the Magny group nobody seemed phased by the incident; there was so much singling, accordian music, and general frivoloity going on that I rather doubted anyone really even noticed. With Charlotte on one side of me and Camille on the other, we joined in the parade. The girls stared at the musicians and Saint Vincent statues and costumed participants (dressed up as old fashioned vignerons and vigneronnes) with wide eyes, and took the whole being part of the procession thing very seriously. 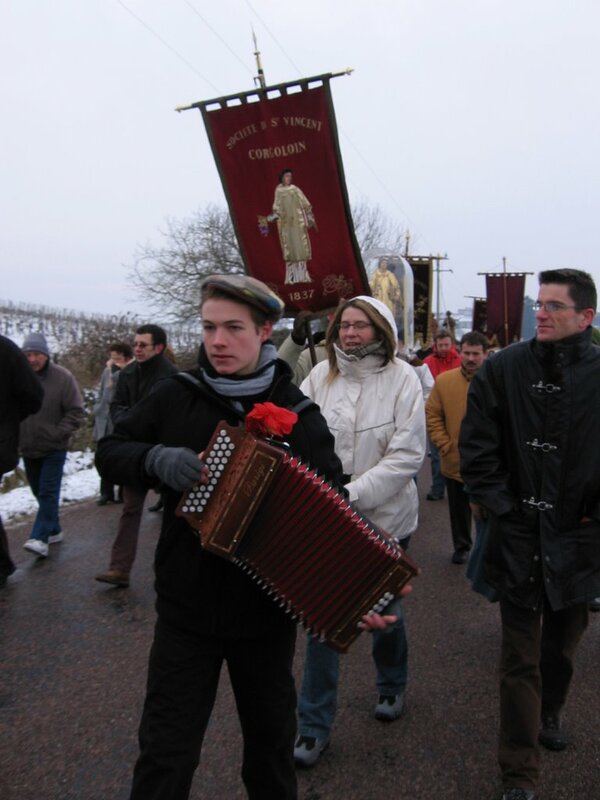 After our arrival in Villers the saints were all carried to the village church, where there was a special mass. By this point we were all starting to lose essential body parts to numbness so we decided to go home and prepare lunch. We had invited our Canadian friends Heather and Bruce from Dijon, and our French friends Isabelle and Martial from Ladoix-Serrigny. We had opted for a raclette , melted cheese with charcuterie and boiled potatoes. Perfect calorie-loading to prepare ourselves for an afternoon winetasting in sub-zero temperatures. In the end we had such a grand time a table, as the french say, that we didn’t get around to walking up to buy our degustation packs (each including a winetasting cup and tickets for ten tastings) until around 4:00. It was only at that point we realized that the caves and winetasting shut down at 5:30. Whoops. But when we ventured out to hop on the free bus to Magny-les-Villers, we realized that maybe staying for so long at the table had actually been a very wise idea indeed. It was freezing out, with a brisk wind that seemed to blow in straight from the plains of Siberia. We rushed to the Cornu’s cave in Magny, and began tasting like crazy. The cold was great for the granitic whites of the Hautes-Cotes, but the reds were definitely too cold. We ambled on to the other cave in the village, where there was a loud gregarious crowd. Soon we found out why. The ticket taking at this cave was negligent at best, so basically you could drink as much as you pleased for free – something which many of the people there had obviously taken to heart. We warmed up with an aperitif at my sister-in-law’s house in Magny, and then headed home, all unanimous that the amount of winasting we had done was just about right. That night, Heather had made a reservation for us at Le Charlemagne, the incredible Japanese-Burgundian fusion restaurant in Pernand-Vergelesses. A meal here is always a highly special event, and the food was amazing, as usual. I think the highlights for me this time were the tube of foie gras on a gingerbread cracker with a celery jam. Well…and then of course the dessert (no surpise there) – a pyramid of chocolate and coconut with sugared red beans that was out of this world. The Sunday Franck and the girls and I took one of the free buses to check out the decorations in the neighbouring villages, which were truly amazing. Every village was bursting with coloured crepe flowers, some of them looking so real that you really had to look twice to convince yourself that they were not. There was also a good dash of whimsy everywhere you looked; fields of corn with crepe cornflowers and poppies, huge painted butterflies, and even a sandy “beach” area complete with a lawn lounge and beach ball. After that we had everyone we could think of in for waffles and cider in the afternoon. There was a bit of a panic getting enough waffle batter ready, but Franck put his friends Martial and Jean-Yves to work. But the waffles were delicious, and we spent a great afternoon catching up with friends and eating waffles in front of the fireplace. I would say a good Saint Vincent was had by all. This entry was posted in Uncategorized on January 30, 2006 by admin. We woke up this morning to snow. Not tonnes like a few weeks ago, but certainly enough to make driving down to Beaune this morning a slippery, slow affair. All the little crepe flowers they put up everywhere are covered with generous dabs of white stuff, and the wooden bees and butterflies look even more incongrous than they did yesterday. The word was that the festival would be cancelled if there was snow or ice, as the roads would become impracticable. I certainly hope not, as the villages are looking so festive and fabulous as the result of so much work on behalf of so many people. And we also have a waffles and cider afternoon planned for Sunday, so I am really keeping my fingers crossed. This entry was posted in Uncategorized on January 26, 2006 by admin. From the veneration of the golden Baby Jesus, the rest of the day went straight downhill. Picking up the girls at lunch I scraped another parent’s car with my rear view mirrior in the anarchaic maw that is the school parking lot. The fact that it was totally, indisputably my fault made it worse. I was running late and I was hungry and I knew the girls were waiting for me so I just tried to squeeze past her. I must remember in the future that spacial perception has never been one of my strong points. The mother was pissed off, and in typical french style got out of the van yelling at the top of her lungs. But when she saw that I was even more pissed off at myself than she was, she calmed down somewhat. Franck is a total stress case with work – bookings, accounting (for France and Canada – fun), loan applications for several different banks, and hideous teetering piles of paperwork everywhere the eye can see. He heard on his favorite radio talk show on Europe 1 yesterday that January 24th is officially the day of the year when people are the most depressed. The expert in question did a very scientific study taking into account several factors such as the weather, the lack of light, the effects of holiday excess, both physical and financial, etc. etc.. I think both Franck and I felt somewhat relieved to hear that – and now I look around me I realize that almost everyone is experiencing varying degrees of winter doldrums. I reassured her with what the expert on Europe 1 had said, and this seemed to cheer her up a bit too. However, while I’m waiting not-so-patiently for Spring, I have also decided to do something to better my lot every day rather than retreat into maligned bitterness like I did last year, waiting for the world to rescue me. This morning I made a chocolate cake with the girls (that delicious french kind with tonnes of butter and chocolate and eggs and only a measly spoon of flour). I just went for a walk, and admired the painted bees and catepillars and crepe flowers they are putting up everywhere for the Saint Vincent. And then I came home and made myself a nice cup of sugary, milky tea which I’m sipping right now. This entry was posted in Uncategorized on January 25, 2006 by admin. This morning I accompanied Camille’s class on a field trip that I just cannot imagine happening in my somewhat WASP’y corner of Canada. Once we kitted the little ones out in their warmest hats and scarves (it’s cold here today) we trundled off to visit the Carmelites of Beaune, and to learn about their tradition of venerating Baby Jesus. Camille was quite sure we would be seeing a real baby, and not being an expert in catholic matters, I wasn’t exactly sure what to expect either. At the entrance to the nunnery we were warmly welcomed by Soeur Bernadette, sporting a brown wool cassock and heavy wooden cross around her neck. She ushered us into the Carmelities chapel where, at the end, in a gilded gold glass case (strangely reminiscent of an Snow White’s coffin stood upright, I thought), was the statue of the venerated Baby Jesus – or “L’enfant roi” as Soeur Bernadette referred to him. The statue was basically a rather grubby looking wax baby doll propped upright, decked out in a shining gold brocaded dress and heavy crown like the kind worn in the old Imperial Margarine commercials. When I pointed at him and told Camille that this was the Baby Jesus we had come to see she looked confused. I was surprised to learn from Soeur Bernadette that the statue, or doll as I couldn’t stop thinking of him for some reason, dated back to the 16th Century. Subsequently the Carmelites of Beaune had created a cult of veneration around him, and prayed to him on a daily basis. “Oh my,” said the other mother. “Personally, I think it was more likely the doctor,” added Michele wryly. Logically I agreed with Michele, but part of me still felt comforted by her mother’s belief in a miracle. When life serves us a whopper of a problem, and strips us of any choice or control in the matter, isn’t it nice to be able to do something? Asking for the help of a higher power and relinquishing the problem to them, even if the higher power takes the form of an ancient baby doll in drag, seems to me to be a singularly sane reaction. Next we were taken into a side chapel where a huge manger scene was set up. The children sat on little wooden benches and admired it with wide eyes. There were not only the usual suspects; Mary, Joseph, Baby Jesus (with golden wings this time), and the three wise men, but also a flock of Carmelite nun figurines and several local peasants with miniature wicker baskets full of plastic bread rolls. Many of the statues were also very old, dating back to the 17th and 18th Century, and most were fashiond by the Carmelites themselves. Soeur Bernadette talked about the manger scene for a bit and then asked a few questions. “Jesus!” Camille answered with confidence. “Noel!” answered Camille again, trimuphant. I flushed with pride. I had not anticipated it, but I am finding that having the girls at a Catholic school and learning about faith has made me question many of the notions I hold about religion. Basically up until now I felt very estranged from organised religion of any kind. I am not sure if this comes from being skeptical by nature or from the fact that I grew up in a society where being a born-again Chrisitian has only slightly less stigma than being a crack addict. Probably both. But the longer I am here in France, untethered from my home, I realize that having faith; in yourself, in love, in the people you care about, in Buddha, Nature, or even a gold statue of Baby Jesus, is key to finding some peace in this life. It seems to me that it’s not the object of the faith that is important, but rather the act of believing in something bigger than ourselves. So I for one am glad that my girls are learning to believe in something – Jesus and Mary and the Angel Gabrielle in their case – even though I would also respect their choice to reject these beliefs as they grow older. Before we left, the teacher had the children sing “Voudrais-tu Marie” to Soeur Bernadette. The song recounts how the angel Gabrielle asks Mary if she wants to carry Baby Jesus in her stomach. I realized as I followed the sweet little voices of Camille and her classmates that sometime during these last few months I had memorized the words. My old blogging method for “The Grape Journal” was becoming too unwieldly. Faced with the blank page, I ended up cranking out epic posts that lasted pages long and took a long time to post. Here, hopefully, I have found the way to a shorter, sweeter posting style that better reflects my everyday life here in Burgundy rather than just large, noteworthy events. Every day here in Villers-la-Faye new decorations are going up for this weekend’s Saint Vincent Tournament, the huge baccanalian wine festival that is hosted by 16 villages of the Hautes Cotes this year. The logistics are going to be an utter nightmare, and I thank the Gods every day that they do not fall under my responsibility. There are going to be shuttle buses going around the sixteen different villages every fifteen minutes for example. This would be complicated enough, but just to add a little dash of excitement into the mix there is also a snow warning for this weekend. Will it work out??? In any case, the village is looking very pretty and medieval with the yellow and red banners (the colours of the village) blowing in the wind and wine barrels stacked everywhere you look for decoration. This entry was posted in Uncategorized on January 23, 2006 by admin.